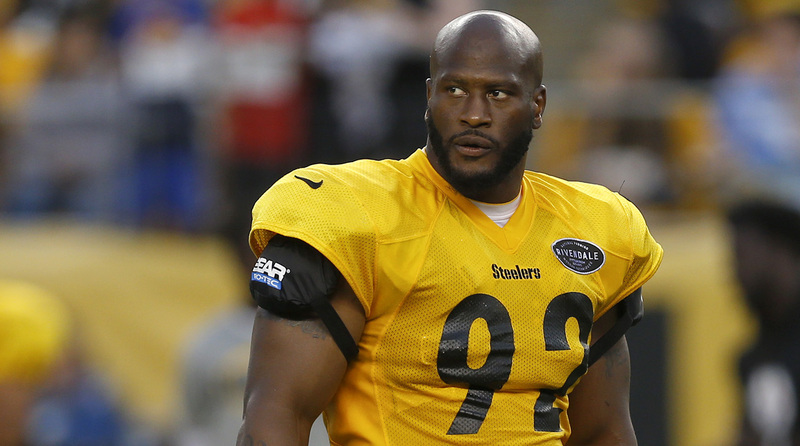 LATROBE, Pa. — On the field, it is known that James Harrison will knock the hell out of an opponent. On the internet, it is known that the veteran Steelers linebacker will knock the hell out of a teammate if he sits or kneels for the national anthem. Only one of these statements is true. Harrison, who has victimized plenty of opponents during his 14 years in the NFL, has twice in the past year been a victim of the Fake News epidemic that has reared its head in the sports world. Last September, at the height of Colin Kaepernick hysteria, Harrison was believed to have said that he would break a teammate’s leg if he didn’t stand for the anthem. And earlier this week, word spread that Harrison proclaimed a Steelers teammate better be in a wheelchair if he’s sitting for The Star-Spangled Banner. Harrison’s true thoughts on a player sitting for the anthem are rather simple. I feel the need to tell you that James Harrison really did say these two sentences about the national anthem protests. I asked him the question. He said those words in quotes above. I can play you the audio later if you still don’t believe me. The fake news didn’t irk Harrison, necessarily, but it puts the focus on a greater issue we’re facing. Roenick’s tweet still stands days later with more than 3,300 retweets, despite numerous replies informing him the news was fake. Burt Lauten, the Steelers’ PR honcho, got word of the story around lunchtime that day. He called Harrison to make sure he hadn’t said it—Harrison confirmed he had not, and Lauten promptly put out a tweet at 1:51 p.m. stating the alleged comments “are false & should not be used as a reference.” Lauten’s tweet, which is almost identical to the one he had to put out around this time last year, has 229 retweets at the time of publication. Harrison says he has more important things to do than figure out the source of the false information and track down the author. He retweeted Lauten, posted to Instagram and left it at that. Five years ago, Harrison’s teammate, Ben Roethlisberger was “reported” to have broken both legs in a car accident. Roethlisberger had been involved in a motorcycle accident six years earlier, so such a report would have fans and observers on edge. Today, this type of hoax wouldn’t pass the smell test, but we weren’t as conditioned to identify fake news back then. Of course, Newton really was in a car accident just outside the Observer building, and I had to hear it from someone who saw him lying on the ground outside before I jetted out of the building and down the road. But, for many, it apparently takes little to believe Harrison offered anti-protest comments. Why are so many so easily convinced Harrison took this stance? Harrison is one of the scariest players in the NFL today. His nickname, Deebo, comes from the large neighborhood menace in the Friday series. He once picked up a rattlesnake by the tail and threw it out of his yard. So, maybe, combine his personality and reputation with last summer’s comments on participation trophies—when he derided youth leagues awarding trophies to players who didn’t win—and that’s how you get so many believing in the fake news.